Before writing the three tales about his detective, "the Chevalier C. Auguste Dupin, Edgar Allan Poe had written two stories which numerous chroniclers of the history of the detective story, including Dorothy L. Sayers, have seized upon as adding to the development of the detective story. Howard Haycraft says, "Edgar Allan Poe wrote only three detective stories: "The Murders in the Rue Morgue," "The Mystery of Marie Roget," and "The Purloined Letter." But, he tells us, "A fourth tale of Poe's, 'The Gold Bug,' is often carelessly miscalled a detective story. It is a fine story, a masterpiece of mystery and even of analysis -- but it is not a detective story for the simple reason that every shred of the evidence on which Legrand's brilliant deductions are based is withheld from the reader until after the solution is disclosed! 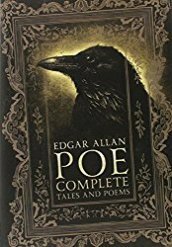 The same objection excludes still another Poe tale, 'Thou Art the Man,' which, in point of fact, comes much closer structurally to qualifying than 'The Gold Bug'" (Murder for Pleasure, pages 9, 10). Without going into great detail because I don't want to spoil the story for you, I just want to point out that "The Gold Bug" (Tales of Edgar Allan Poe) introduced the concept of deciphering a code. Poe became fascinated with the subject. In 1841, two years before "The Gold Bug" was published, he wrote an essay on Secret Writing. He also published some ciphers submitted by "W. B. Tyler" (but which some scholars believe he created himself) and challenged readers to solve them. Poe's character William Legrand solves an old cryptogram (or cryptograph, as Poe coined it) written on parchment or vellum. A type of invisible ink is employed that is made visible by bringing the parchment into close proximity with heat. Legrand's full analysis, explication, and deciphering is worth reading, and the act of deciphering secret codes has found its way into the literature of the detective, crime, and murder mystery genre. It has influenced writers including Arthur Conan Doyle (who incorporated it into "The Dancing Men" and The Valley of Fear, for example), R. Austin Freeman ("The Moabite Cipher"), Dorothy L. Sayers (Have His Carcase) and many, many more. The solution of Poe's alphabet-substitution code hinges on the fact that certain letters occur more commonly than other letters, so if you tally them up, as Legrand does, you can make an educated guess at some of them, and then, building on that, fill in others as you work through it. "Now, in English, the letter which most frequently occurs is e. Afterwards, succession runs thus: a o i d h n r s t u y c f g l m w b k p q x z. E predominates so remarkably that an individual sentence of any length is rarely seen, in which it is not the prevailing character."